Here you can meet a host of endangered animals. The Cango Wildlife Ranch is internationally recognised for its far-reaching conservation efforts. They are one of the leading breeders of cheetah in Africa, and one of the largest in the world. You can touch a cheetah, enjoy the closeness of a tiger cub, wrap yourself in a python and even dive with Nile crocodiles. From a raised catwalk, you will see cheetah, lion, puma, jaguar and our white Bengal tigers in action. Our snake park exhibits unusual and rare reptiles from all over the world, such as the giant albino Burmese Python, the extraordinary looking prehensile skink (lizard) and the fearless 4m King Cobra, the longest most deadly snake in the world! 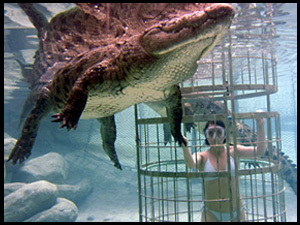 Wander along a variety of crocodile and alligator pools accommodating more than 300 Nile crocodiles. These feared predators range in size from 50cm babies to 4m monsters. Experience a fascinating tour of fact or fable with our multilingual guides as they venture into the crocodile enclosures. Adding to the uniqueness of the experience you can visit a host of other attractions situated in our gardens; including our colony of suricates, emus, wallabies, raccoons, flamingos, peacocks, bat-eared foxes, Vietnamese pot- bellied pigs and not forgetting Herbert and Hilda, our Pygmy Hippos.